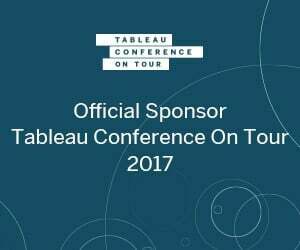 If you need robust analytic performance on SAP data, but for whatever reason don’t want to use HANA, VirtDB and EXASOL got you covered. In this article we will explain how you can load SAP ERP data to EXASOL using Data Unfolder to speed up your ERP analytics. EXASOL is a high-performance, in-memory, MPP database specifically designed for analytics. It enables you to analyze large volumes of data in real-time, helping you to accelerate your BI and reporting and turn data into value. We added EXASOL as a target database in the new release of Data Unfolder. This means that you can extract any SAP dataset to EXASOL directly. In this case we are going to extract the BSEG table from SAP with VirtDB’s Mass Data Extractor module. Let’s see how easy it is in practice. 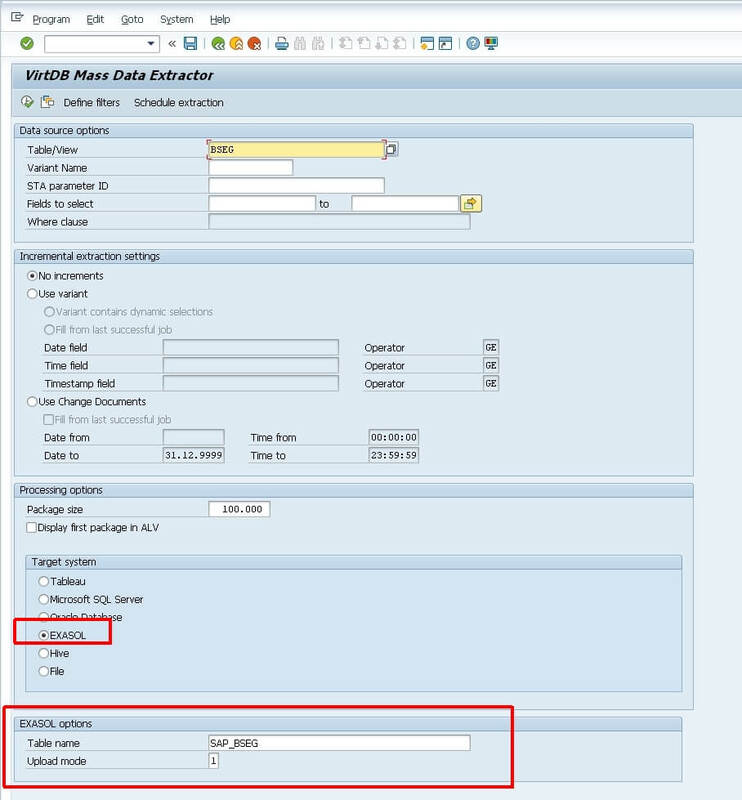 Open Mass Data Extractor by running transaction “/n/vdb/mde” in SAP. In the top section you can define which table you’d like to extract and configure filtering criteria. In this case we are just selecting BSEG and push it to EXASOL without any filtering. We already discussed incremental loads in this previous post. Incremental extractions can reduce load on the SAP application server and network and extraction time, because less data is being processed. 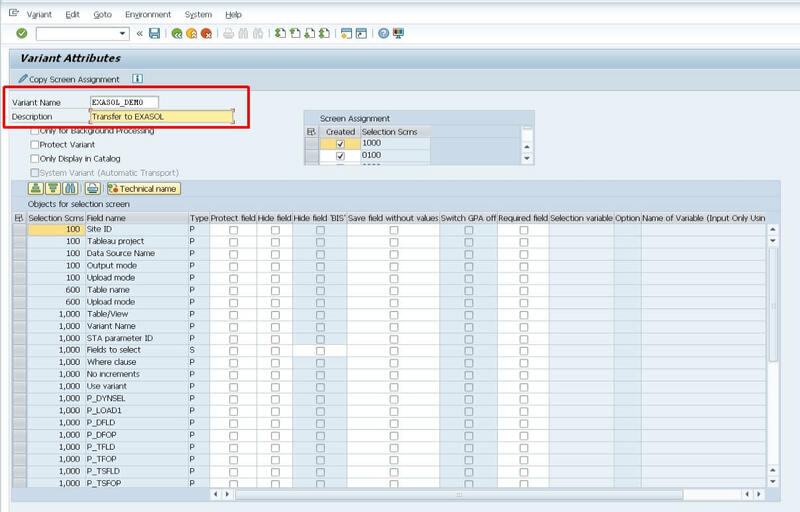 Increments can be made based on time and date fields, timestamp fields or change document if that is enabled in the SAP system. This time we will do a full extraction of BSEG to EXASOL so we select no increments. In the third section you can specify processing options like package size and target systems. Right now we would like to have our SAP tables in EXASOL, so simply select the option accordingly. As you can see on the screenshot below the last section will vary according to different target systems. Let’s give a creative and descriptive name to our future EXASOL table like “SAP_BSEG” and select upload option 1, which is the full extract. After everything’s set, save it as a variant as shown in the screenshot below. 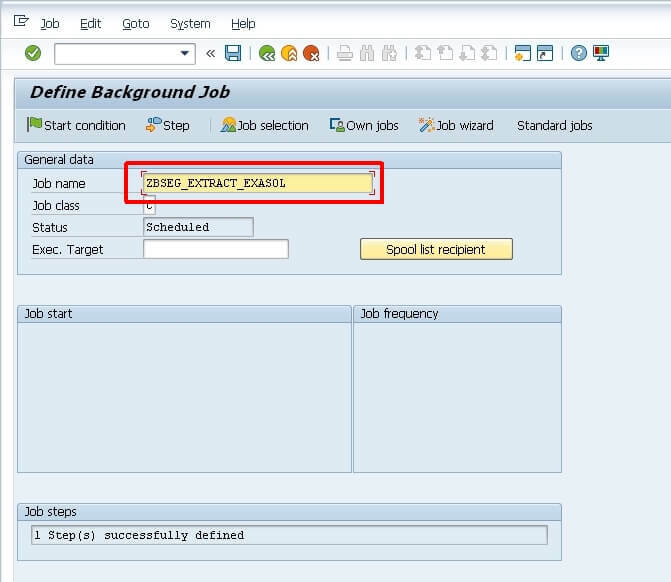 The next step is to define a SAP background job to in the standard job scheduler using the variant we just created to initiate the data extraction. If you open EXASOL you will see that both a table and a view has been created with the same name we defined in SAP. The difference between the two is that the table has the original column code names from SAP like “MANDT” while the view has more descriptive column names such as “Client” or “Company Code”. Enjoy Super-fast analytics of your SAP ERP data powered by EXASOL.